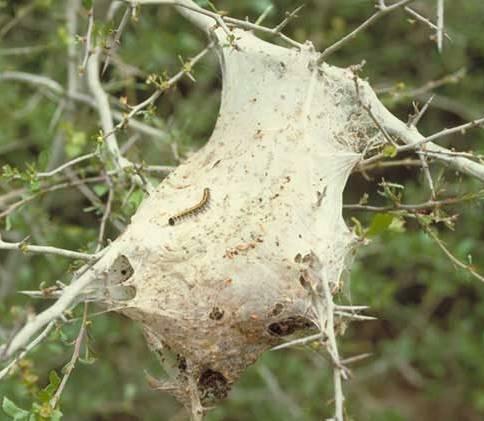 Life cycle: The E. Tent Caterpillar produces one generation each year. The larvae are present in the later part of spring, cocoons, and moths in early summer, and eggs for the remainder of the time. Overwintering is done by the egg. The larvae, or caterpillar, hatches in the spring from egg masses about the time the first leaves begin to open. The young caterpillars keep together and spin a tent with their silk in the crotch of a tree. When mature, about six weeks after hatching, they spin cocoons on tree bark, fences, brush, weeds, on buildings, and among dead leaves and debris on the ground. Physical Description: The 2-inch long caterpillar is black with white stripes and narrow brown and yellow lines on the sides with a row of blue spots, and is very hairy. The adult moth is a reddish brown and has stripes on the fore wings that have a span of 1 to 1 1/2 inches. The eggs are laid in a ring around twigs and covered with a foamy secretion that dries to a firm brown covering that looks like an enlargement of the twig. Egg masses usually contain 200 eggs. Feeding characteristics: This pest attacks apple, wild cherry, pear, and other fruit trees, as well as, an occasional rose, hawthorn and various shade and forest trees, by making a tent and feeding from within. They can defoliate many deciduous trees and shrubs over a wide area in a short time. In good weather, they leave their tent several times a day to search for food, stringing silk after them. When they are done eating on a tree, they leave the nest to search for food. Controls: You can control the Eastern Tent Caterpillar by handpicking if you have only a few infested trees. Since they congregate in groups, you can easily destroy them by tearing the nests out by hand or with a brush and pole, crushing the insects. In the winter, you can destroy eggs by cutting off the infested twigs and burning them. If there are wild cherry trees in the area of your orchard, remove them. Various Ground Beetles and predaceous wasps, such as the Digger Wasp are natural predators. A commercial pathogen, Bacillus thuringiensis controls this larvae.